Tintin Heart: New Challenge - Crafts Galore - Bingo! New Challenge - Crafts Galore - Bingo! 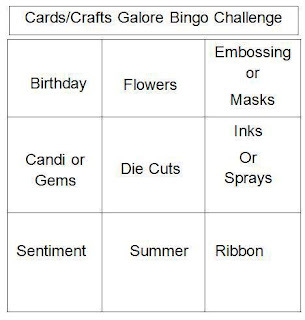 My post today is my DT project for the new challenge starting today over at the Cards Galore blog and the new theme is BINGO!!! The usual rules apply, select a row , vertically, horizontally or diagonally to get your combination of elements and make your project incorporating all these elements. For my project I have chosen to use 'Embossing or Masks - Inks or Dyes - Ribbon' and the image I am using is the Woodland Elf from Scrapper's Delight. I started by using Photoshop to digitally colour the Elf image, the intention was to use my new Silhouette Cameo to cut it out. My learning curve is a bit steep so I opted to print the image and then cut by hand. 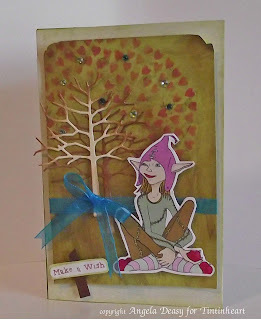 I wanted to created a woodland background to make the elf image pop and I chose a muted green backing paper and inked the edges with Ranger Vintage Photo ink to age and distress the paper a bit. I then used a Memory Box die to cut the tree shape and used the negative image as a mask to ink in some branch shapes with the same ink. I spritzed the front of the panel with Perfect Pearls Mist in Heirloom Gold to bring out a sheen which sadly you can't see from this photo. Looks fab though. I enjoyed this exercise and getting inky is always fun. I hope you take some time to visit the blog at Cards Galore and take a few mins to check out the DT projects made to help and inspire you with your entries. Don't forget to link your entries back to the blog and remember to leave us your comments. Good Luck and I am looking forward to seeing how you combine your chosen BINGO elements in your entry.